On Sunday night, April lies in bed, trying to sleep. She is excited. On Friday she and her mother will take a train to her grandmother's house. Almost a week is such a long time for a little girl to wait. But as April takes a bus ride, goes to the market, visits her father at work, and eats lunch at a diner, the days slip by. Everywhere she goes, there are people who are different sizes and shapes, and have different needs. At last it's Friday; April and her mom are on their way. At her grandmother's, April will see lots of flowers, each one as different as the people she has seen during the week. 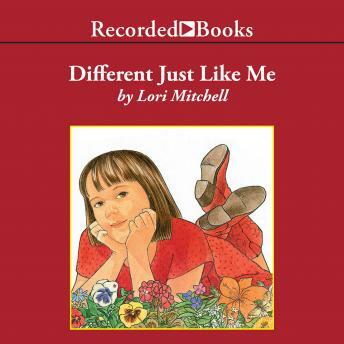 Featured on The Oprah Show, Lori Mitchell's gentle book teaches a wonderful lesson about appreciating individuality. Different Just Like Me is an American Book Association Kid's Pick of the Lists and was given the Director's Choice Award by Early Childhood News.